Abshire was active throughout the 1930s, recording for the RCA Bluebird Company in 1935; his career was interrupted by a brief stint in the army during World War II. After the war, Abshire was a central figure in the revitalization of traditional Cajun music. His Pine Grove Blues, recorded in 1949 for the O.T. label, was a regional hit and an important recording in the postwar revival of the accordion. In the 1960s, he became one of the first musicians to take Cajun music beyond the borders of Louisiana, traveling with the Balfa Brothers to concerts and folk festivals throughout the United States and Canada. Abshire also hit his stride as a recording artist in the late 1960s, turning out a string of remarkable records for the Swallow label that included Tramp Sur La Rue, Lemonade Song and Valse De Bayou Teche. Although a highly respected and influential musician, Abshire was never able to support his family completely with his music. He was, for many years, employed with the town of Basile, Louisiana, where admirers from all over the world would come to see him. Nathan Abshire died at Basile on May 13, 1981. He asked to have his music buried with him… a request that was not honored. Mr. Nathan, who died in 1981, was one of the giants of the Cajun accordion. He is here in great company (mostly the Balfa Brothers) playing 20 of his great numbers. Hearing “Pine Grove Blues”, “Fee Fee Poncho”, and “Valse de Bayou Teche” are worth the purchase price alone. Abshire was a great singer and could wail on the blues on his bottom-box. It’s also great to hear Rodney Balfa sing on a few numbers. Abshire’s motto was “The good times are killing me;” they did, but as Barry Ancelet points out in the notes, “Against his wishes, his music was not buried with him.” Thank goodness is wasn’t. When people in the “business” refers to roots music, often forgotten are some of the wonderful styles fostered and developed in North America. One such tradition is Cajun music. Once of the foremost recent stylists of this music was Nathan Abshire. An accordionist’s accordionist, he picked up the squeezebox at age 6 and never put it down. He played the music the way it was meant to be played – with heart and passion. Fortunately, when he died in 1981, Abshire left a legacy of tremendous music, much of which is found on this “best of” cd. From the jubilant cry that kicks off “Pine Grove Blues” to the “last dance” feel of “Partie A Grand Basile”, Abshire guides us through an hour of joyful and spirited celebration. Led by his accordion, backed by the rhythms of the Balfa Brothers and punctuated by emotional if occasionally piercing vocals, this collection is a moving tribute to a culture that has struggled for years and, thankfully, persevered. Another carrier of the Cajun cultural torch is Dewey Balfa, the fiddler from the old Balfa Brothers band. On his own since the deaths of his siblings Rodney and Will in 1979, Dewey has continued in his role as a Cajun musical ambassador ever since. Unlike Abshire’s music, Balfa’s style is fiddle-driven with the accordion more in the background. The fiddle is a versatile instrument, and in the master’s hands it shows all of its moods, from jubilant to mournful and everything in between. The 21 cuts are mostly instrumentals. This, however in no way diminishes the impact of the music. With the help of his son Tony on guitar, daughter Christine on triangle, father-son fiddle combination Tracy and Peter Schwarz, young accordionist Robert Jardell and others, the elder Balfa crafts a finely honed collection of Southern songs that are comfortable to dance to or to enjoy relaxing in your favorite chair. The title says if all! Twenty tracks from Abshire’s recordings for Floyd Soileau cut in the lat 60’s. 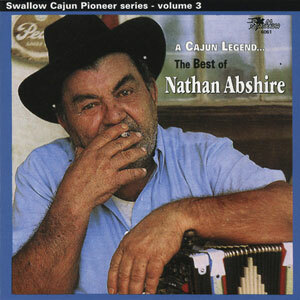 It’s been a decade now since Abshire passed, but he will long be remembered as close to the best Cajun accordionist. The original “Pine Grove Blues” was recorded in 1949, over a decade after his initial Bluebird recordings and a slump in the popularity of the accordion. The bluesy sound was a winner, but there was no follow-up. Abshire continued to play local dances but didn’t return to significant recording until the early 60’s with J.D. Miller. Back on a roll, he then joined Soileau for his best and most prolific recordings. Two albums were released with backing from the Balfa Brothers, Pine Grove Blues and The Good Times Are Killing Me. These are the source of this present CD, and you couldn’t find a better example of top-notch Cajun music. Opening with a great remake of “Pine Grove Blues”, the immaculate backing of fiddle, triangle and steel guitar brought out the best in Nathan. Some of the numbers like “Valse de Holly Beach” and “Shamrock” are proven Abshire specials while “J’etais Au Bal” and the wonderful “Lemonade Song” based on the jazz favorite Eh La Bas, are enduring Cajun classics. There is also Nathan’s version of Joe South’s “Games People Play” featuring Don Guillory on vocals, that turned out a minor hit in 1970. Rodney and Dewey Balfa lend their vocal talents as well as exemplary playing to a few numbers. These tracks finally broke Nathan Abshire out of his undeserved obscurity and he went on to become a popular attraction at festivals and colleges. But he wasn’t able to duplicate his success on other labels and unfortunately alcohol and bad health took their toll. He was never able to sustain himself with music and spent much of his working life as the caretaker of the Basile town dump, a position that must have shocked many of his admirers who came to visit him. Luckily we have this magnificent collection to remind us of his true worth.